Like many other modernist buildings constructed in the city during the period, its cutting-edge design was never fully appreciated by most Edmontonians. The concrete and plaster were barely dry when it was criticized for being inadequate for the needs of the booming city. It survived just 33 years and was demolished starting in 1989 to make way for the current City Hall. The story of the 1950s building goes back two decades earlier, when the City began holding informal discussions about the need to replace the 1913 Civic Block. World War II intervened, and it wasn’t until growth pressures brought by the oil-driven boom that started in 1947 compelled the City to act. 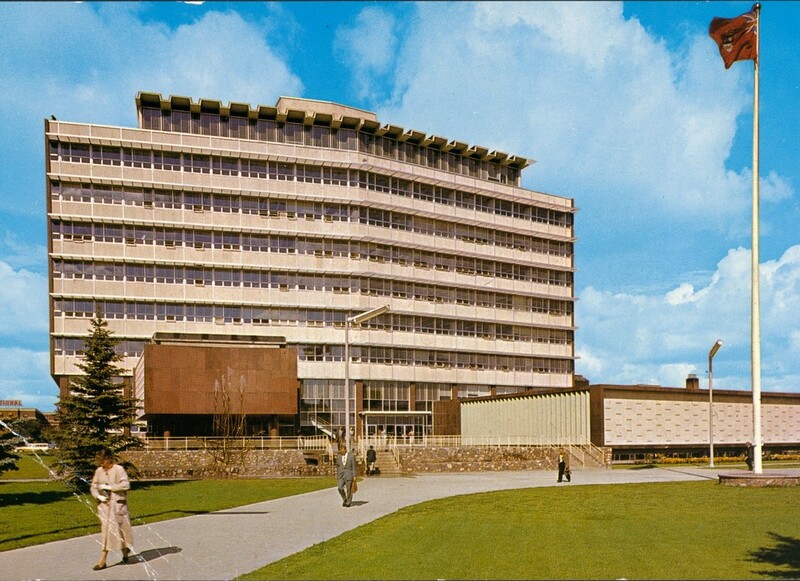 A Civic Centre Committee was formed and, in 1953, tentative plans were announced to construct a building that would accommodate all the offices in the 90,000-square-foot Civic Block and city functions that had spilled into several other buildings downtown. The budget was set at between $2 million and $2.5 million, and Alberta architects were invited to compete for $10,000 in prizes for the winning design. The competition idea turned out to be too complex, and instead, city council commissioned the Edmonton architectural firm of Dewar, Stevenson and Stanley to complete the design. Their plans were made public on April 2, 1954. Maxwell Dewar, who was a former architect for the City of Edmonton, foretold the future when he said that he expected citizens would be a little shocked. But he was confident Edmontonians would grow to admire the modern-style building with its three distinct sections for legislative, administration and consumer services. The daring design called for a double wedge-shaped structural steel building 123 feet high with 130,000 square feet of floor space, and a council chamber suspended 12 feet above the ground next to the front entrance. The building measured 180 feet long, and its wedge shape made it 58 feet wide at the two ends, and 80 feet wide in the middle. The ninth storey was a rooftop cafeteria topped with an undulating canopy. Horizontal aluminum window louvres provided shade over south-facing windows. Three fully automatic, electronically operated elevators travelled at a speed of 500 feet per minute. The new structure was envisioned as the northern anchor of a long-planned civic centre around the square. A story in the April 3, 1954, edition of the Edmonton Journal quoted Dewar as saying that the proposed building was to be “as dignified and functional as possible in a modern style but not to be bizarre or modern merely for the sake of being modern.” Citizens were quick to respond, and the suspended council chamber was dubbed with a variety of nicknames including grand piano, sardine tin, casket, and bath tub. Dewar said that the architects had been inspired in their design by the United Nations Building in New York, which had opened in 1952, and they patterned the council chambers after the UN General Assembly Room. The chambers had tiered seating with room for 200 spectators, and its windowless construction was designed to contrast with the extensive use of glass in other parts of the building. Council gave the design its approval, a row of houses on the site were demolished, and foundation work began in December 1954 under the direction of contractors Rush and Tompkins. Completion was targeted for August 1, 1956, but material and labour shortages slowed construction. The new hall was ready for occupancy by 770 staff members in March 1957. The City commissioned University of British Columbia architecture professor Lionel A.J. Thomas, a nationally known sculptor, to design a fountain for the front of the building. He spent days in Vancouver’s Stanley Park sketching geese before he devised a 20-foot high fountain meant to emulate a flock of nine Canada geese and symbolize flight and progress. Called “The Migrants,” the bronze fountain featured five geese in vertical positions and four of them flying. It could be illuminated at night by turquoise, amber and white lights. When operating at full blast, the fountain could shoot water about 40 feet high. The system had so much power that, on windy days, pedestrians were getting sprayed, and the city had to lower the pressure. Thomas and two assistants produced the individual pieces in Vancouver, and then assembled them on site. “This fountain won’t be duplicated,” he said. When the building opened, citizens were dazzled by luxurious materials that included Swedish imperial red granite, and marble and travertine from Italy. Alberta fieldstone was used on the exterior and in the lobbies. The total floor area added up to 164,000 square feet, and glass covered 26,388 square feet of the exterior. When all the bills were paid, the cost of design and construction totalled $3.5 million. Sadly, Maxwell Dewar died in 1955 at the age of 45, and wasn’t around to hear the praise when the building was officially opened by Alberta Lieutenant-Governor J.J. Bowlen in May 1957. By the late 1970s, the building was deemed outdated, and too expensive to operate. It was demolished in 1989 and 1990 after a ten-year wrangle that included a court challenge and a municipal plebiscite. The infamous fountain had the last laugh. It was incorporated into the new City Hall when it opened in 1992. Edmonton City Hall, circa 1960. City of Edmonton Archives, EA-20-990.